This machine is suitable for these professional companies which product pillows cushions. Mainly used to open and process fiber to fill into pillow, cushion toy, sofa, etc. 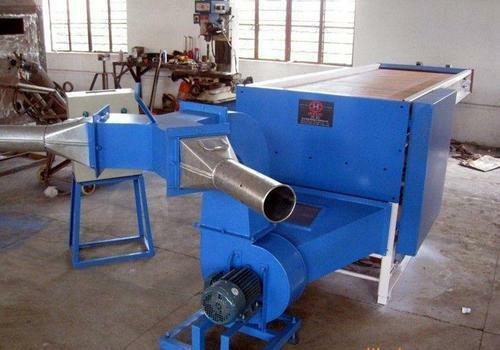 The new generation of DYZX-300 automatic pillow filling machine, which adopts the computerized technology opening and loosening fiber,transporting fiber machine by blowing fan ,adjusting the fix-quantity according to user's need putting fiber into the pillow case by blower fan. at the same time, we can install the shaker flaps the pillow, makes it well-proportioned, plump and uneasy to change shape. Incepted in the year 2000, S-Tex Enterprises is a well-known organization affianced in supplying, distributing, importing and trading of a premium quality plethora of Metallic Wire for Cotton, Textile Machinery, Metallic Wire for Woolen and Garnett Machine, Textile Machine Accessories, Needle for Non Woven Industries, Stripper Wire and Feed Roller Wire with Spacer Wire, Opening and Filling Machine for Pillow, Metallic Wire for Non Woven Machine to the industry. Widely recognized and acknowledged across the nation and market frothier high corrosion resistance, longer life, premium finish standards and sturdiness, these provided products are developed in tandem with the industry define norms and guidelines. Utilizing optimum class raw inputs and other factory material in their development process, our offered range is manufactured in line with the latest market trends and developments. Known for their uses and applications in numerous industries and purposes, these are enormously demanded in the industry and favored by our patrons. Additionally, we assure to deliver a flawless range to our patrons because of our supreme quality management policies.